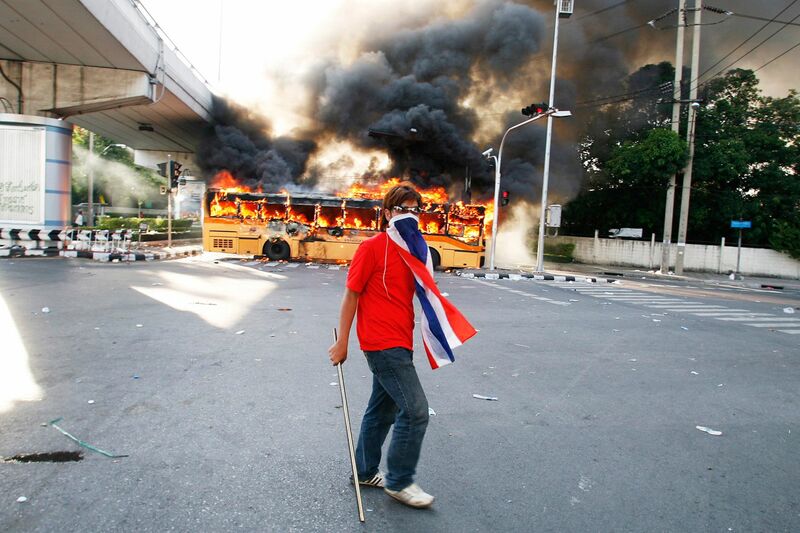 A member of the anti-government United Front for Democracy against Dictatorship (UDD) walks past a bus torched by the UDD in Bangkok. 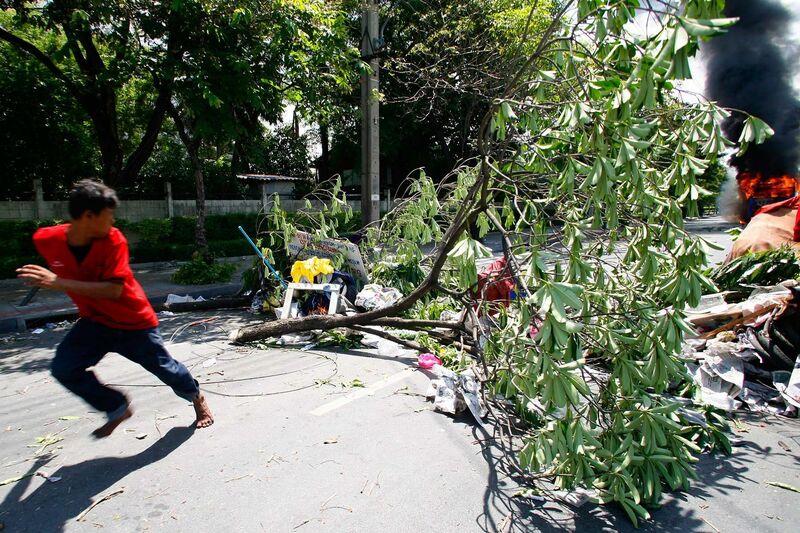 Two days of rioting by the UDD left two people dead and some 100 injured. 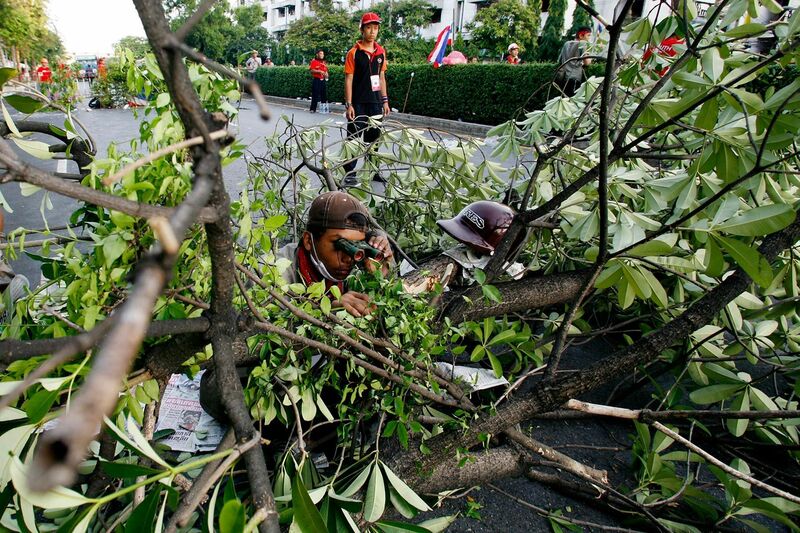 Thai soldiers prepare to move in and clear a roadblock set by the anti-government, United Front for Democracy against Dictatorship (UDD) . Members of the anti-government United Front for Democracy against Dictatorship (UDD) smash a firefighter truck sent after a bus was torched. 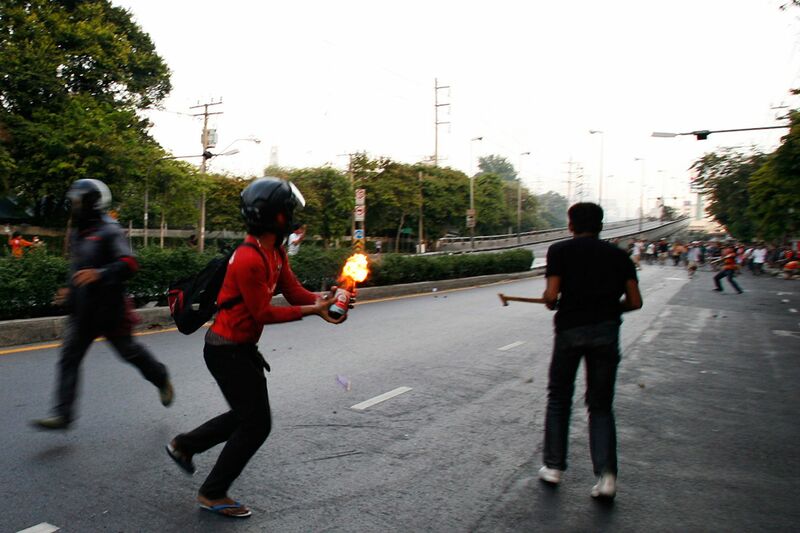 A member of the anti-government United Front for Democracy against Dictatorship (UDD) throw a petrol bomb during a street fight against residents. 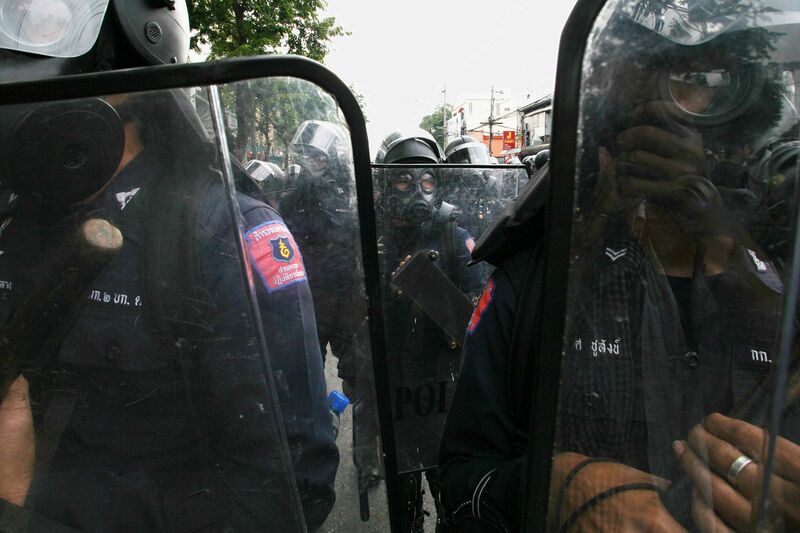 Riot police ready for action against the People's Alliance for Democracy (PAD) who tried to block access to parliament and police left two people dead and some 400 injured. 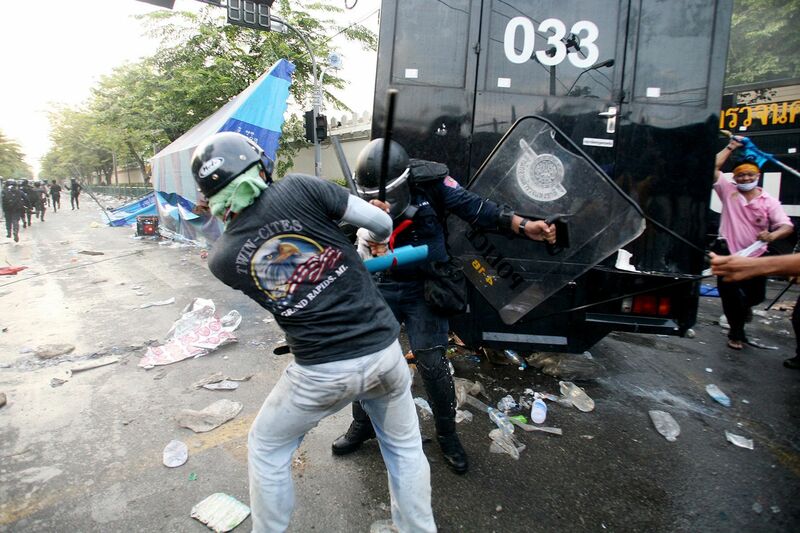 People's Alliance for Democracy ‘s (PAD) Demonstrators beat up a police officer. 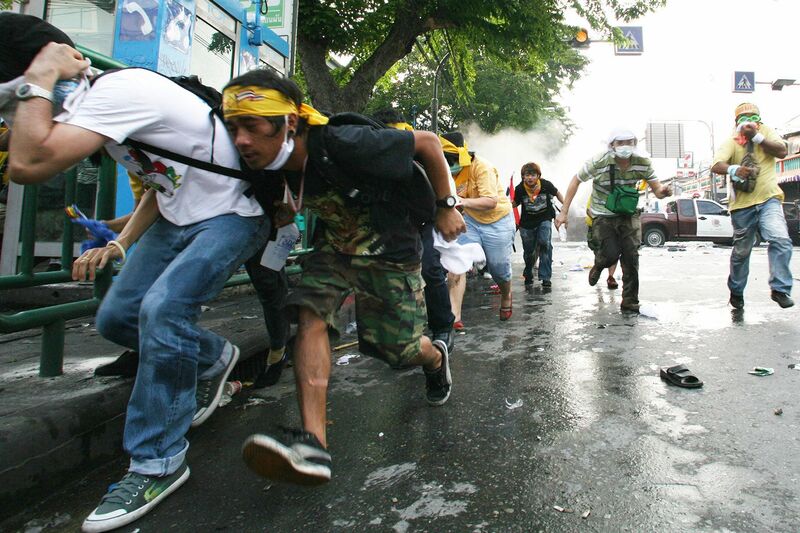 The People's Alliance for Democracy ‘s (PAD) protesters run away from tear gas. 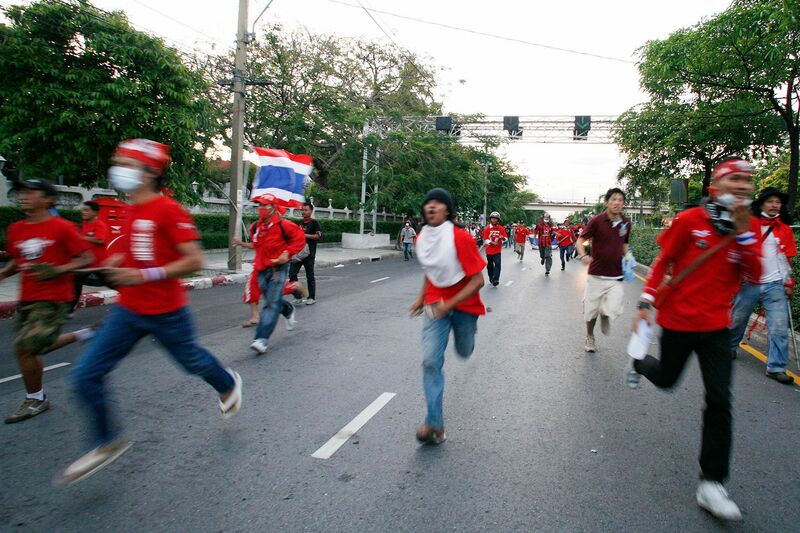 Members of the anti-government United Front for Democracy against Dictatorship (UDD) run during a street fight against residents in Bangkok. The People's Alliance for Democracy’s (PAD) Demonstrators sheltering from tear gas. A man tries to evacuate a female demonstrator who froze after tear gas exploded behind her. 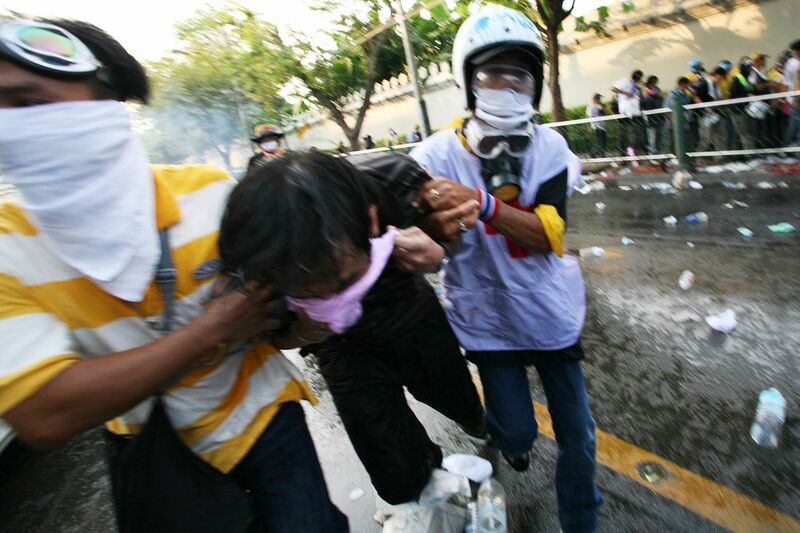 Clashes between police and the opposition group People's Alliance for Democracy (PAD) who tried to block access to parliament left two people dead and 400 injured. Demonstrators of People's Alliance for Democracy (PAD) shelter from tear gas. 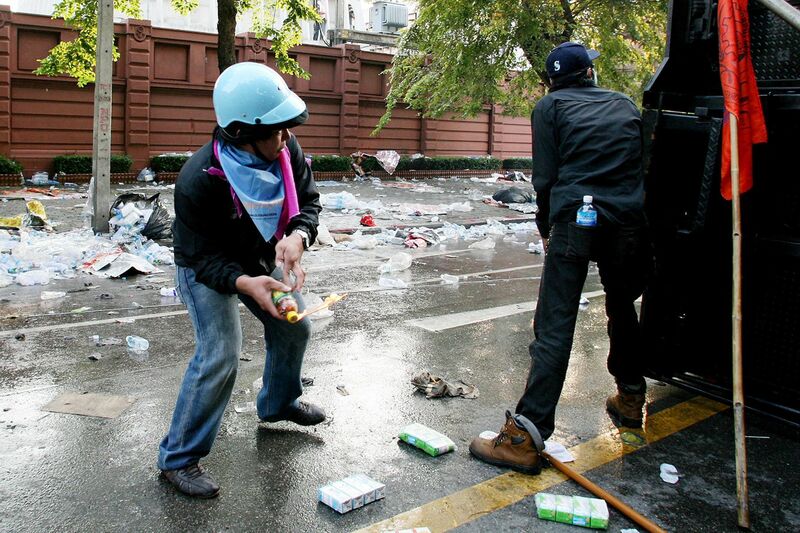 A demonstrator throws a petrol bomb at police during clashes between the People's Alliance for Democracy (PAD) and police. 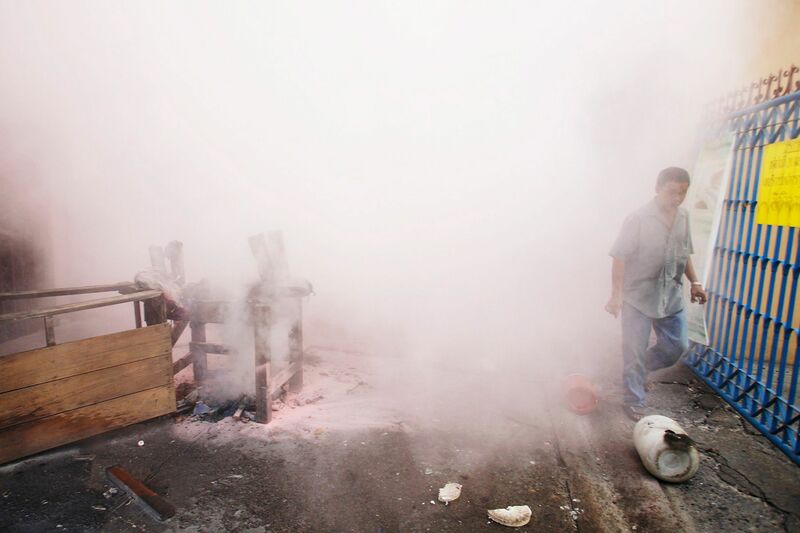 A civilian walks next to a torched bike after extinguished a fire. Members of the anti-government United Front for Democracy against Dictatorship (UDD) watch the bus they torched at a barricade in Bangkok. 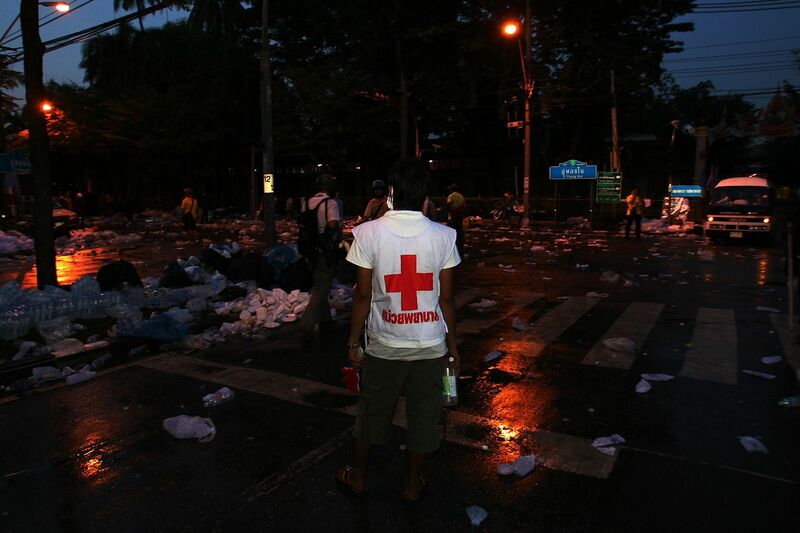 Red cross worker stands and looking for an injured person during crash between the People's Alliance for Democracy (PAD) and Police. 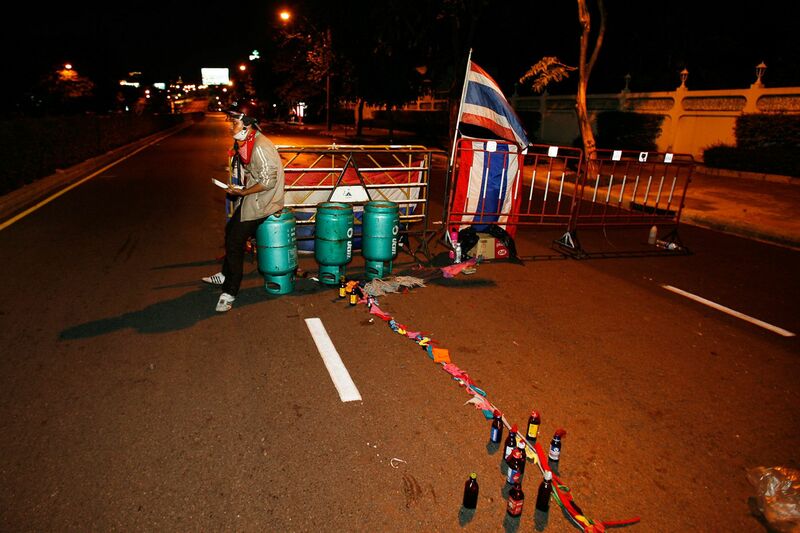 A member of the anti-government United Front for Democracy against Dictatorship (UDD) sits at a roadblock with a reserve of petrol bombs and gas bottles in Bangkok. 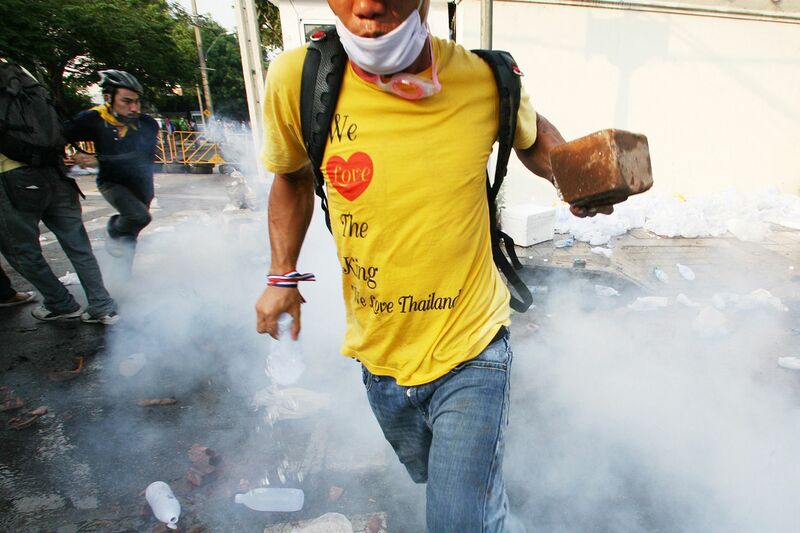 A demonstrator carrying a brick runs away in a cloud of tear gas during clashes between the People's Alliance for Democracy (PAD) and police. 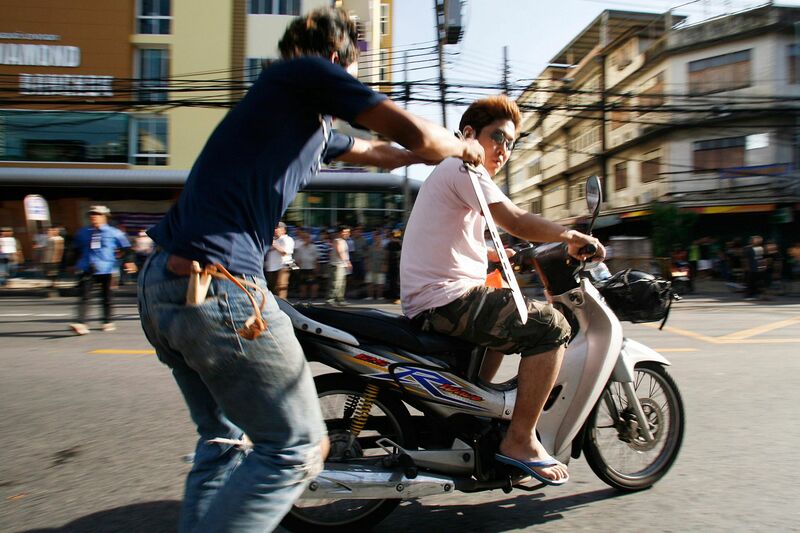 A member of the anti-government United Front for Democracy against Dictatorship (UDD), carrying a sword and slingshot, jumps on a motorbike to join a nearby street fight against residents in Bangkok. 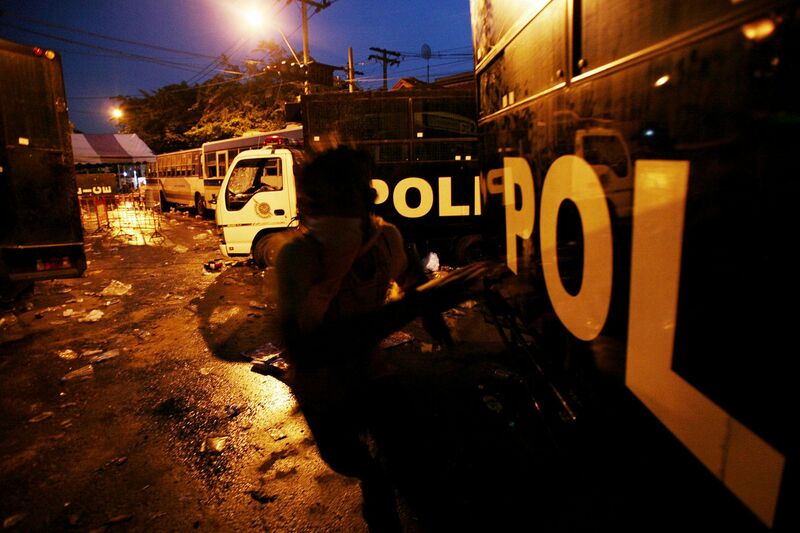 A member of People's Alliance for Democracy (PAD) runs behind police vehicles as clashes subside in the evening. 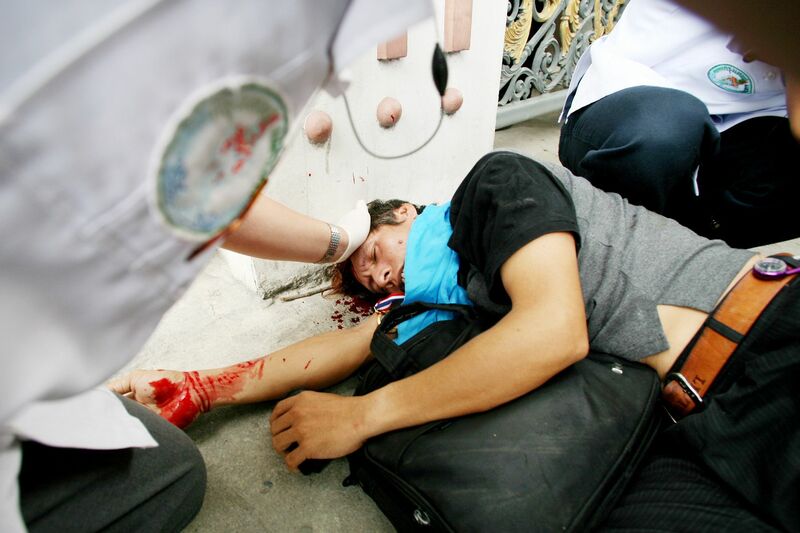 Clashes between police and the People's Alliance for Democracy (PAD) who tried to block access to parliament left two people dead,injured 400. 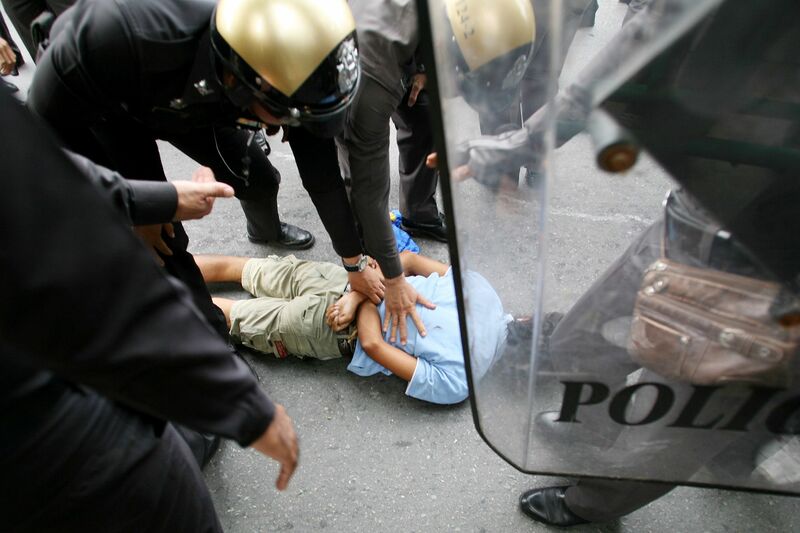 An injured demonstrator lies on the ground. 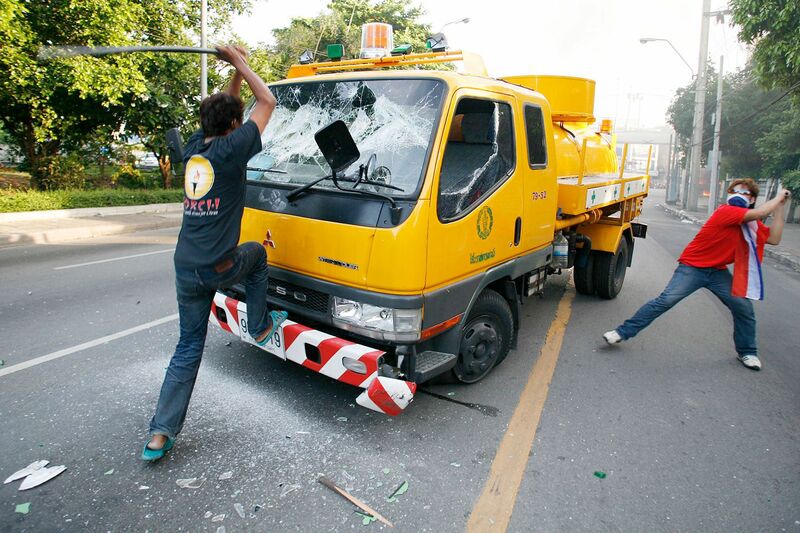 Clashes between the opposition group People's Alliance for Democracy (PAD) who tried to block access to parliament left two people dead and some 400 injured. 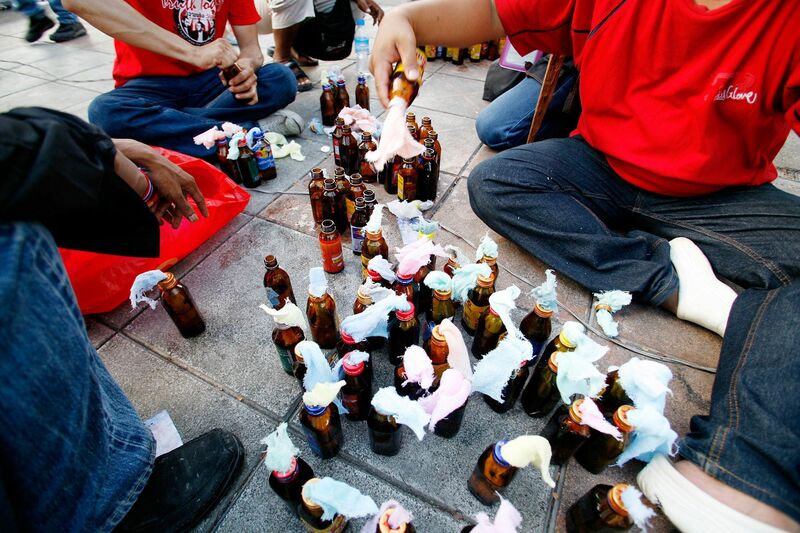 A member of anti-government United Front for Democracy against Dictatorship (UDD) prepare petrol bombs as soldiers move in to clear an intersection in Bangkok. 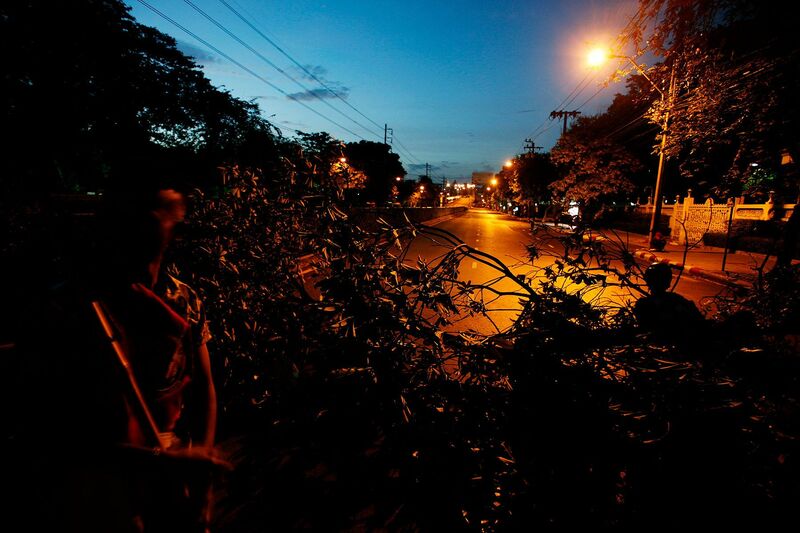 A member of the anti-government United Front for Democracy against Dictatorship (UDD) watches soldiers at a barricade in Bangkok around 4 am. 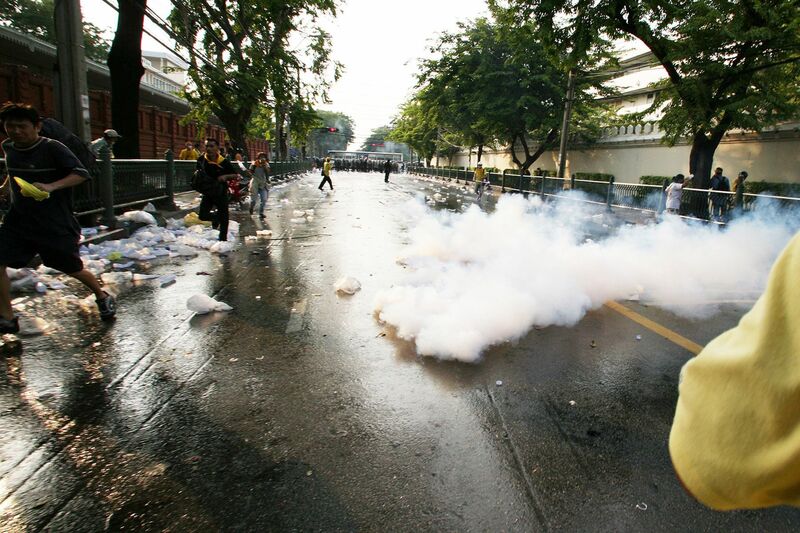 Two days of rioting by the UDD left two people dead and some 100 injured. 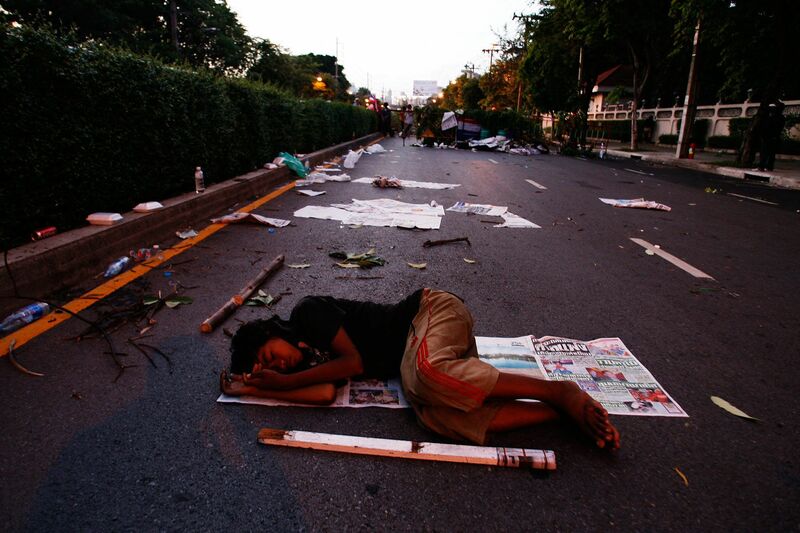 A ten-year-old boy protester from the Northeast sleeps on the street at dawn at a roadblock set by the anti-government United Front for Democracy against Dictatorship (UDD) in Bangkok. 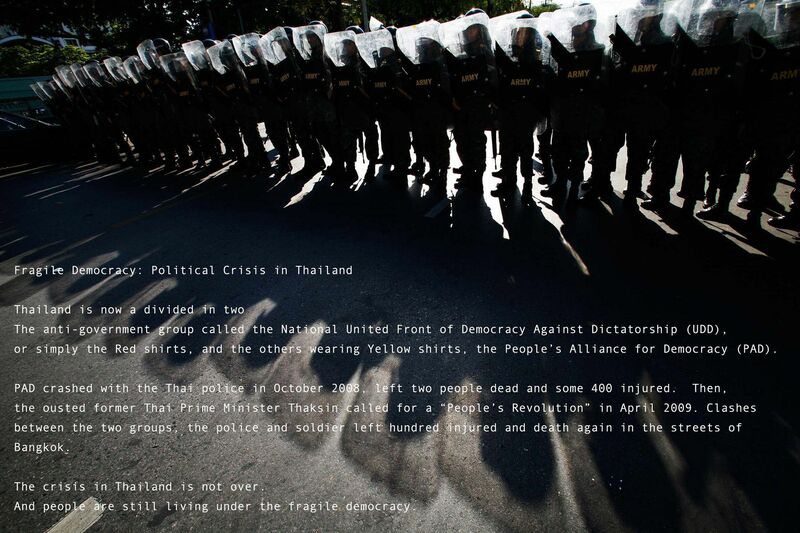 Two days of rioting by the UDD left two people dead and 100 injured. 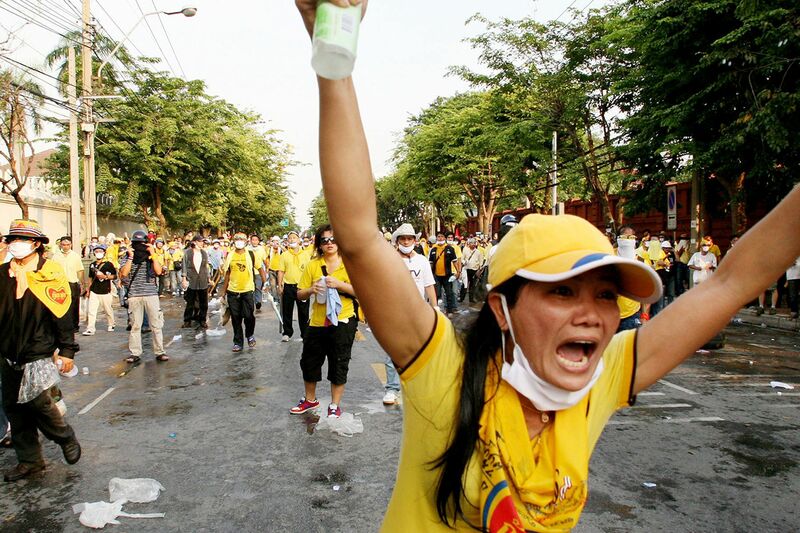 A demonstrator shouting at police after they fired tear gas. Clashes between police and the opposition group People's Alliance for Democracy (PAD) who tried to block access to parliament left two people dead and some 400 injured. 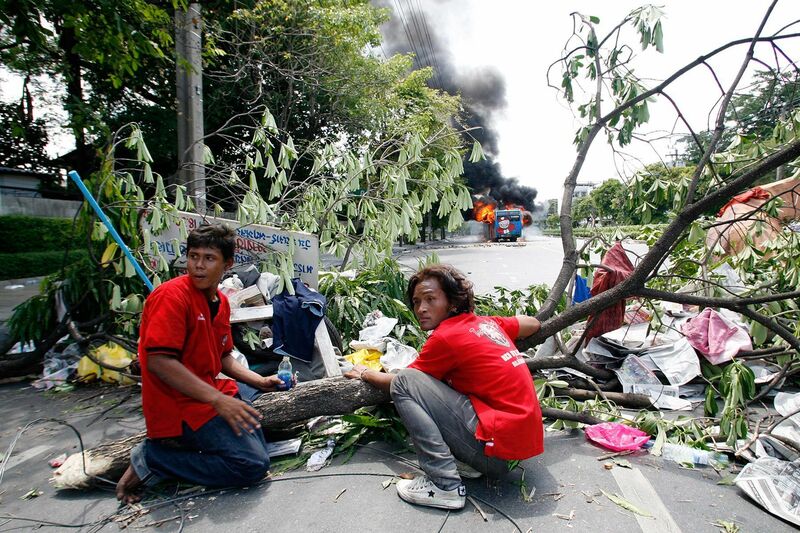 Members of the anti-government United Front for Democracy against Dictatorship (UDD) run away after they torched a bus near at a barricade in Bangkok. 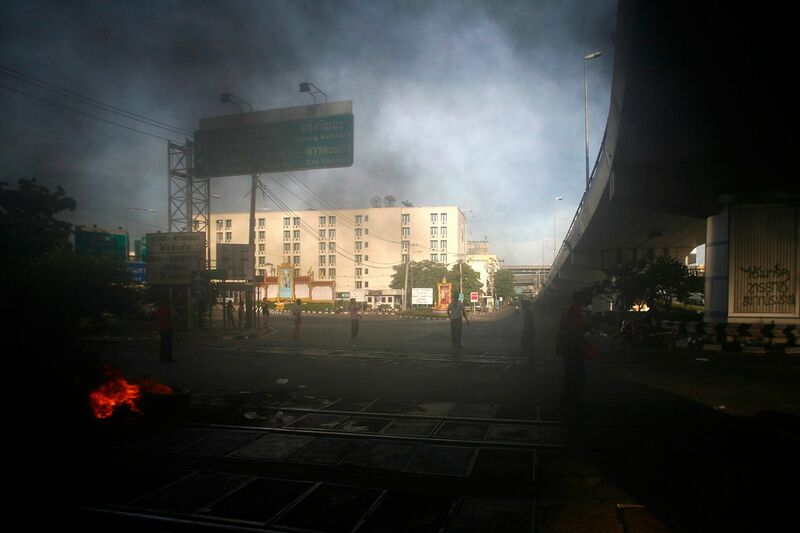 Two days of rioting by the UDD left two people dead and some 100 injured. 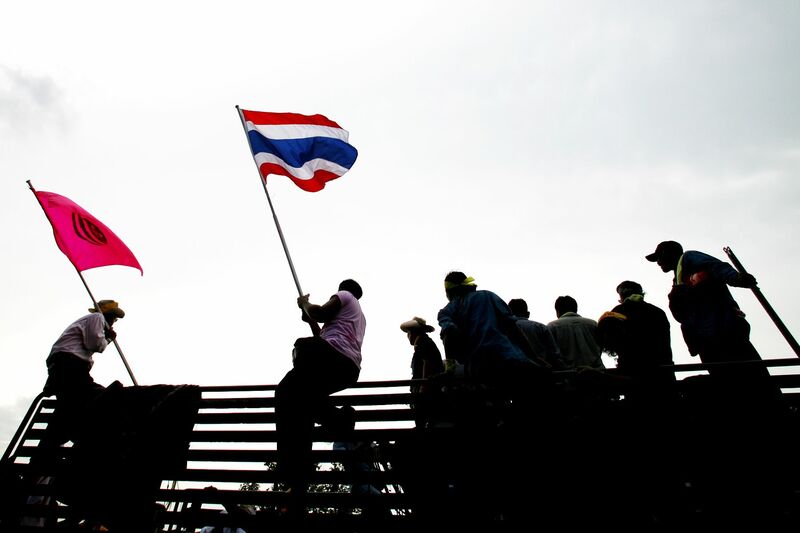 Members of the anti-government United Front for Democracy against Dictatorship (UDD) in Bangkok. 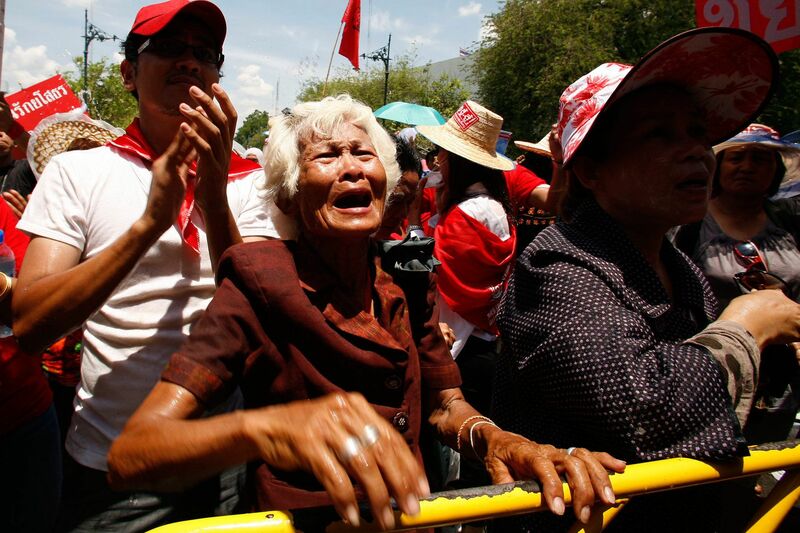 An elderly woman of the anti-government United Front for Democracy against Dictatorship (UDD) cries as she learns their leaders have called to halt their protest at Government House. Two days of rioting by the UDD left 2 people dead, 100 injurued.